Eucritta melanolimnetes is a recently described species of tetrapod from the Visean of Scotland. It is one of a range of tetrapods found at the East Kirkton Quarry near Edinburgh. Other taxa include anthracosaurs, temnospondyls, stem amniotes and aistopods, and they represent the earliest known terrestrial tetrapod fauna. 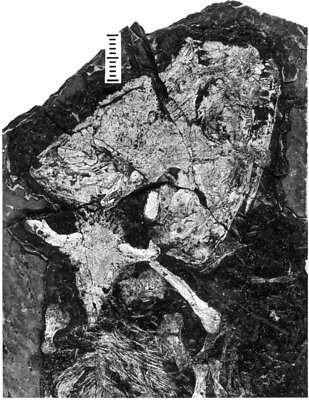 Eucritta shows a mixture of temnospondyl-like (eg. wide otic notch) and anthracosaur-like (eg. closed palate, girdle features) characters, but also shows incipiently the anterior embayment of the orbit found in baphetids. It clusters with baphetids in phylogenetic analyses (eg. Clack 1998, 2001, Ruta et al. 2003), as the basalmost member of the clade. Clack, J. A. 1998 A new Early Carboniferous tetrapod with a mélange of crown group characters. Nature 394: 66-69. Clack, J. A. 2001 Eucritta melanolimnetes from the Early Carboniferous of Scotland, a stem tetrapod showing a mosaic of characteristics. Trans R. Soc. Ed. 92, 75-95.
see Clack, J. A. 2001 Eucritta melanolimnetes from the Early Carboniferous of Scotland, a stem tetrapod showing a mosaic of characteristics. Trans R. Soc. Ed. 92, 75-95. Page: Tree of Life Eucritta melanolimnetes. Authored by Jennifer A. Clack. The TEXT of this page is licensed under the Creative Commons Attribution-NonCommercial License - Version 3.0. Note that images and other media featured on this page are each governed by their own license, and they may or may not be available for reuse. Click on an image or a media link to access the media data window, which provides the relevant licensing information. For the general terms and conditions of ToL material reuse and redistribution, please see the Tree of Life Copyright Policies.